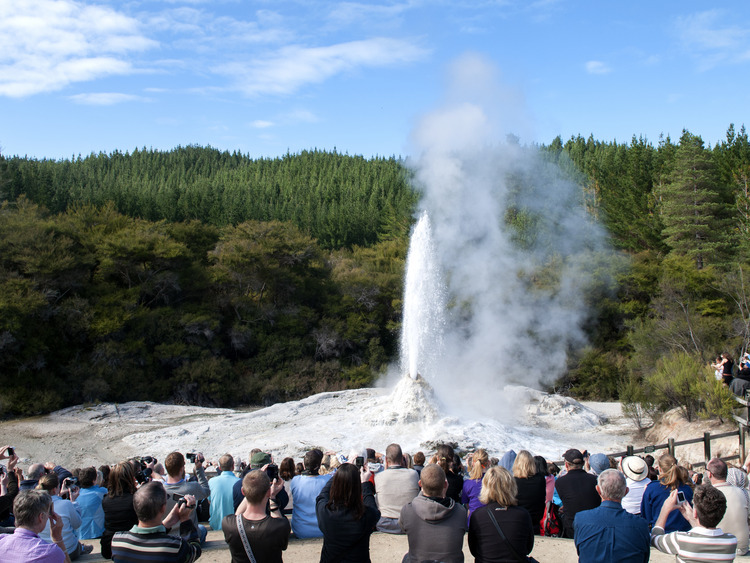 We will explore Rotorua, a city famous for its hot springs and geysers, and be enchanted by the Maori culture. We will board our coach and head south towards Rotorua, a famous city nicknamed “Sulphur City” due to the intense thermal activity that takes place there. We will visit Te Puia Thermal Reserve, which is also home to the New Zealand Maori Arts and Crafts Institute. There we will be welcomed at the Marae, the centre of Maori community life, where we will sit and watch traditional song and dance performances as well as a Haka show, the typical war dance of the Maori people. Our tour will continue with a visit to some wood carving and linen weaving workshops and Kiwi House, home to the volatile nocturnal symbol of New Zealand. Next, we will enjoy an exciting walk through the geothermal reserve, where we can admire silica terraces, bubbling mud pools and the famous Pohutu geyser. If we have enough time, we can buy some souvenirs before leaving Te Puia and travelling through the centre of Rotorua.